We are so humbled by the overwhelming support, wishes, and kind words we have received since making our big announcement and can’t thank you all enough. I was actually really nervous to share our news initially and by the time I did, I was bursting at the seams to share but was still anxious. There have been so many of you to let us know that we are in your prayers, or who have shared your own experiences… it’s truly been a blessing and going through your messages and emails has been a highlight of our month. We actually just received our profile books in the mail and are trying to keep our minds busy and do what we can during this season of waiting. For me, throwing myself into browsing, planning, designing, and shopping all things nursery has become my therapy. It’s the one thing I feel I can control and because it’s the first (and likely only time) we’ll be preparing a space for a baby, I am all in. Everything that arrives in the mail receives at least a few minutes of “oohs and ahhs and ‘how tiny!s'” A challenge that comes with it though is that because we don’t know who our baby is, we also don’t know his/her gender. And, we may or may not find out before we meet. So, like any biological family who decides to keep it a surprise, we are planning a totally gender neutral nursery. Because we are going for lots of neutrals (grays, creams, whites), I am working extra hard to bring in lots of textures so even though the result will be a unisex nursery, it won’t be a boring nursery. I started planning a space for our child months ago, casually placing orders for weeks, and am really going to try to get it close to completion over the next month or so. Since we don’t have a timeframe, I would love to be close/completely finished so we can concentrate on the other things 😉 We’ve cleared out the old guest bedroom, brought in a few pieces, and even added picture frame molding to the wall but the painting, hanging, and installation hasn’t really begun just yet. It’s turning out to be pretty accurate to my initial plan though so today, I’m sharing the direction we’re going and the gender neutral nursery design board. 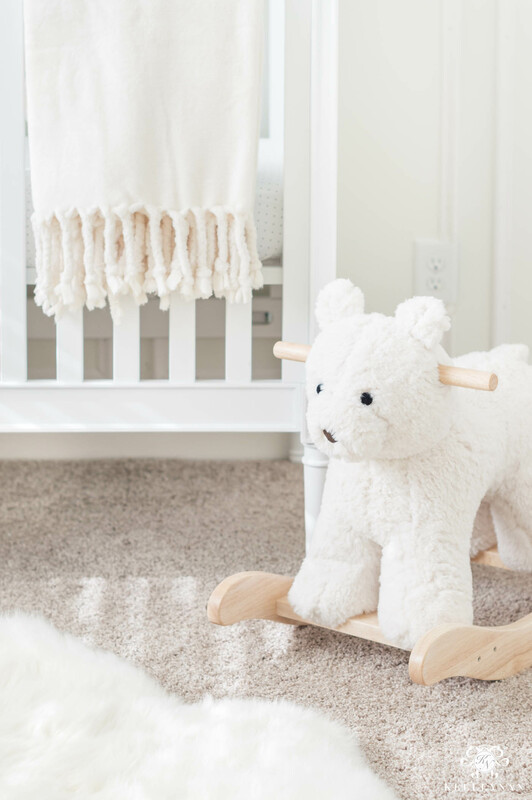 My goal: to create a calming, baby-friendly room, loaded with textures and natural elements — something light and bright that could take on more/different personality as time goes on. I want it to be a happy space with lots to look at (which some of the personality will likely shine more when some of those details and art come together) but instead of going baby everything, I actually chose a few universal pieces that I love. Some are more of an investment but I plan on having them around for a long time. Instead of a changing table, I went for this wide, mosaic double dresser; we have the room, it offers a ton of storage, and we plan to set a changing pad on top. I have had my eyes on this light fixture for a long time (I even considered two for our kitchen pendants) and was so happy to finally have a place (and reason) to pull the trigger. I already gave a peek at the walls (the room is being painted in a new white next week ;). Again, because we are going so neutral, I wanted something back there to add a little excitement. I originally thought of a board and batten focal wall but the level of detail I shared with my carpenter would have been custom and labor intensive, which means expensive. Instead, I suggested five floor to ceiling vertical picture frame boxes. So easy, much more affordable, and I love the result. Without a doubt, my favorite piece in the nursery is the crib. The classic shape and precious cane sides… I looked for a long time and just didn’t find anything that came close to how I felt about this one. It does convert to a toddler bed (and comes with the conversion kit) and then a daybed down the road. Coming home from my hair appointment and seeing Dave in the nursery, setting it up- I can’t even describe how much my heart swelled, peeking in on that unforgettable moment. I received the sherpa bear rocker a few days after Christmas and just wanted to walk around hugging it. There are a TON of animal options available (see them HERE) and I believe most are on sale this weekend. You also have the option to add a name, which of course, we declined. The verdict is still out on these bins. They arrived and I love the look even more in person. BUT, they are collapsible and seem to need to be filled in order to stand properly. I got both sizes- one for throws and one for toys – and need to fill them and test to make sure I’m gonna keep ’em. They are also on sale this weekend HERE (honestly, most of the nursery is 😉 ). 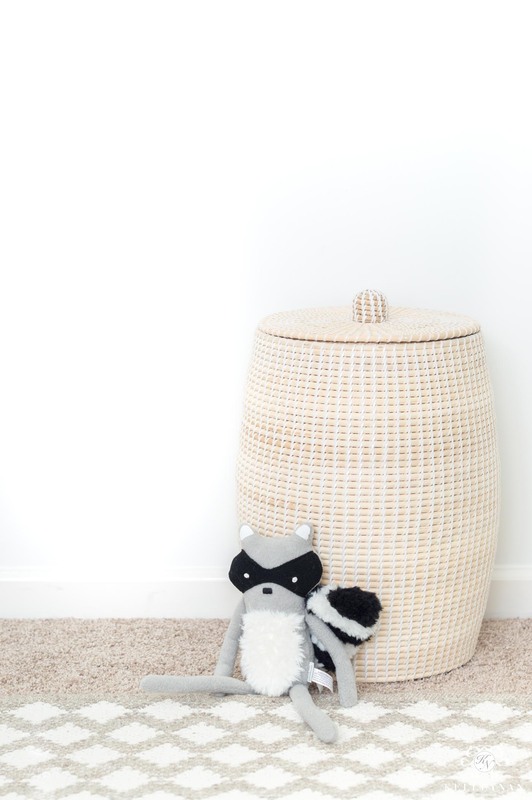 This little hamper (marked down $30) is even perfect for a guest bedroom if you don’t have kids, and after my first, more classic crib bunny, I was excited to order this more modern, leggy raccoon guy (also on sale and available in a few animals). 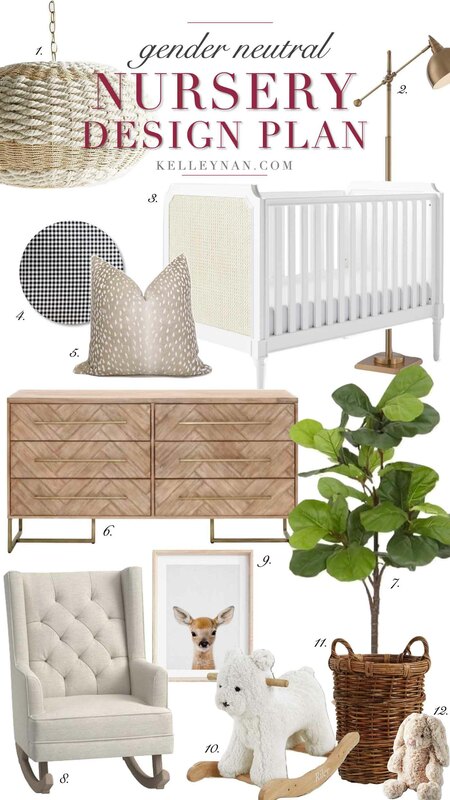 It’s funny, aside from the crib, this single fawn pillow was one of the first things I knew I wanted for my neutral, woodland-esque nursery. You can order it in any size from my friends at Willa Skye HERE, but mine is a 22″. And just in case anyone sees this and wants to correct me, yes, I know I can’t leave it in the crib with the baby ;). It’s a throw pillow that will be removed – just as I remove the throw pillows from my own bed before climbing in. When I asked this week on Instagram about nursery must-haves I need to know about, I would say at least 50% of responses had to do with a comfortable chair. I ordered THIS ONE (again, a couple months ago) in a substantial Sunbrella performance fabric (in pebble). It’s firm and the arms seem to hit nicely and according to the website, it’s easy to convert to a regular chair should you ever want to remove the rockers. 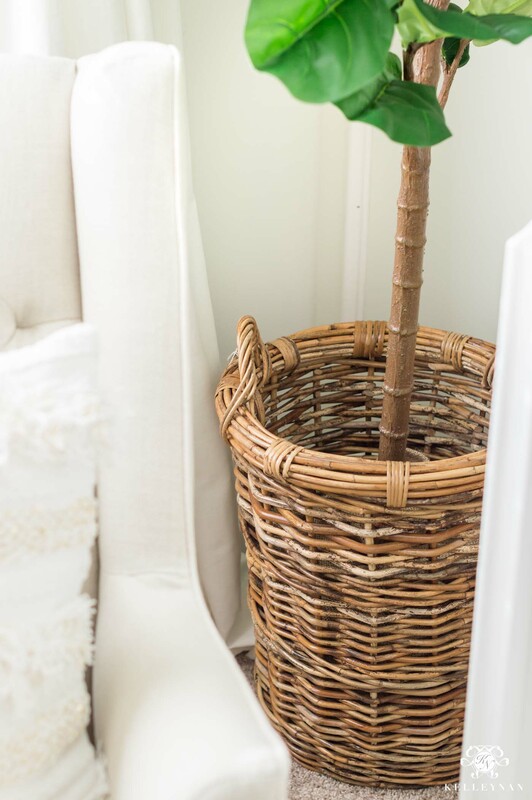 Our fiddle leaf fig basket hamper is over 40% off this weekend, too! This is the medium sized tree and it is set pretty far down into the hamper. While the chair was more of an investment piece, this little nubby pouf was not. I ordered it for $49! It’s available in several patterns/colors and goes far beyond being used in a nursery. As usual and as I’ve done in every room since I discovered them, I’m using Select Blinds for a curtain/woven blinds combo. 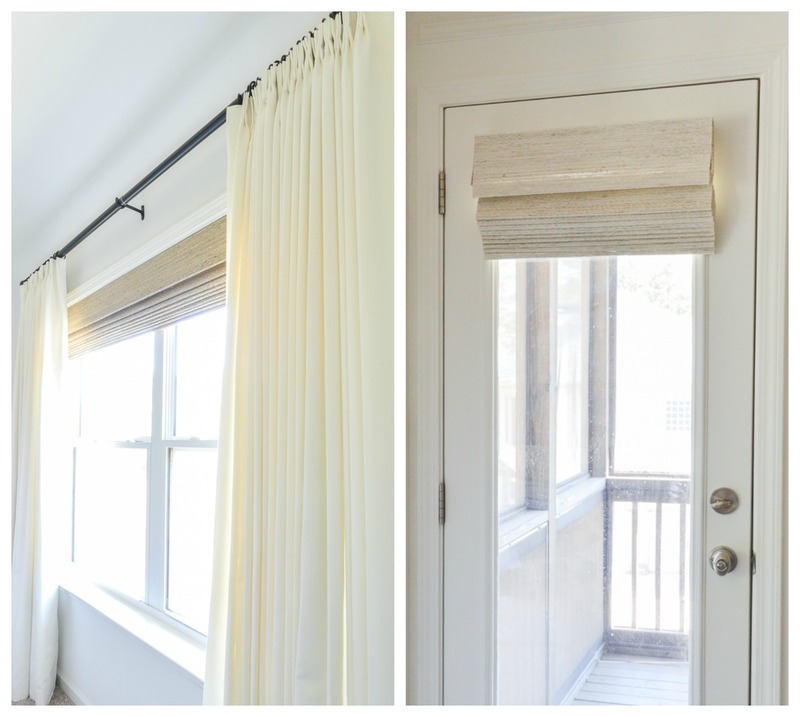 Along with a brass rod and rings, they are providing the same curtains I used in the guest bedroom — pinch pleated drapes in Linen Weave Vanilla Bean (HERE) and the Bali White Designer Series Wooden Woven Shades with blackout liner and cordless system (HERE). I can’t wait for them to come in but here’s a look at the materials in other rooms of my house. If you’re doing custom shades, spring for the cordless system. It’s so easy and keeps the shades so well maintained. I’ll be sharing as the space unfolds and will be sharing some answers to some of the most common questions we’ve received about the adoption thus far- if you have anything to add to the list of questions (or wisdom to share regarding adoption, gear, nurseries, or babies in general), I’d love for you to leave me a note in the comment section below! Absolutely beautiful…. and filled with love……enjoy this special time in your lives. Sooooo beautiful Kelley! What a special place for all of you. Such exciting news and I am very happy for you and your family! So beautiful. This room shows the love you have put into it. Your expected bundle of joy will be very lucky to have such thoughtful and loving parents. What a peaceful place! Can I be our baby? Lol. I love the fawn pillow. I have seen it a few times in IG and would love to find a home for it in my own home!! Your excitement is bursting through on your baby posts!! What a thrilling time for our both. Oh my goodness…I love how everything is coming together! This special room is already full of love. You are so smart to get things so perfectly ready now. The progress is so fun to watch! 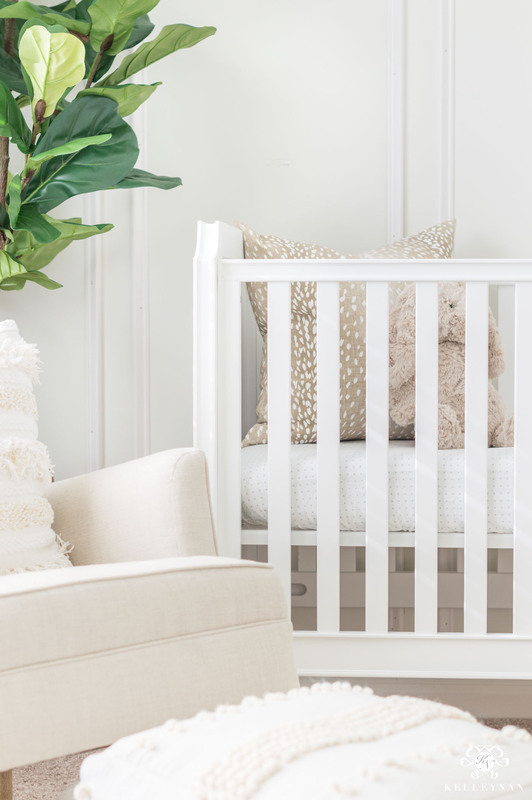 Your nursery is just dripping with sweetness! I love it all, and so will your precious little one. Embrace every single second of the process of becoming a mom. It will, no doubt, be the sweetest journey you will ever travel. God is good, and we all cannot wait to see how things unfold for you guys. Be sure to keep a journal along the way. It will be a wonderful, handwritten story for your baby’s life, and will serve as a reminder of God’s faithfulness. Sooooo very excited for you all. There are just no words! Each new piece you showed just made more and more excited along with you for the arrival of your little gift!!! It. Is. Absolutely. Adorable!!!! You meshed so many adorable styles together so well! That dresser though😍😍😍. So happy for you, Kelley!!! 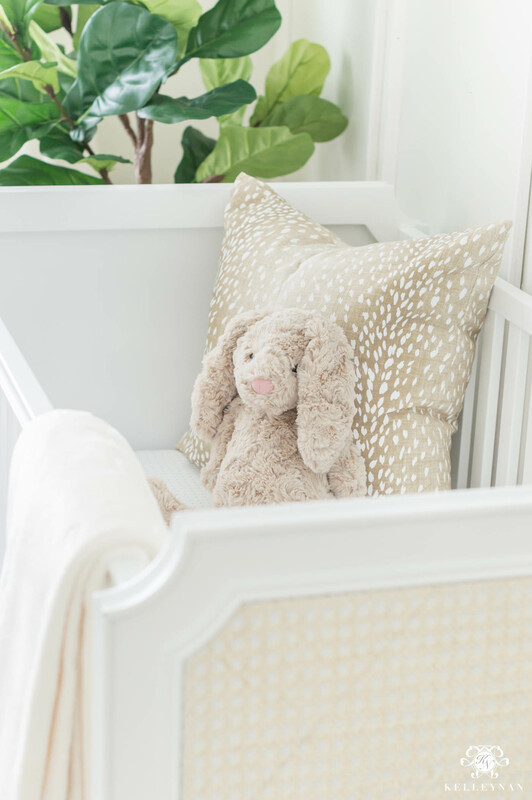 I think this nursery reveal will be the most anticipated in the history of blogging! It is going to be amazing 🙂 as is your little one. Continuing to send prayers and looking forward to seeing more of this beautiful space. So happy for you and Dave,as you begin this new chapter of your life. The room is darling. The joy and fun are just beginning. I am sure that you, will also have a great time dressing this little one. I think the room is really nice. Babies can’t see colors for the first 4-5 months and actually respond best to black and white during that time. You may want to incorporate some high contrast art work for the first few months and then transition it out as the baby begins to recognize colors. Also I think the best addition to your nursery would be a Mammaroo (so?). I have given them as gifts to new parents and they all said it was a godsend. Just lovely! Hope you don’t have to wait long! Everything is turning out beautiful, your baby will be so blessed to have you as a mom. Congratulations!! Congratulations! I found your blog by searching for information regarding Pottery Barn sofas. I love your comparisons of the PB Comfort, Pearce and Cameron sofas. My question is: Is the Pearce sofa made in North Carolina? I ordered a leather ottoman last year. Unfortunately, it was made in China and had a bad odor, among other issues. Thanks! Love the 5 picture frame vertical boxes on the wall…what an impact that makes on a blank wall! 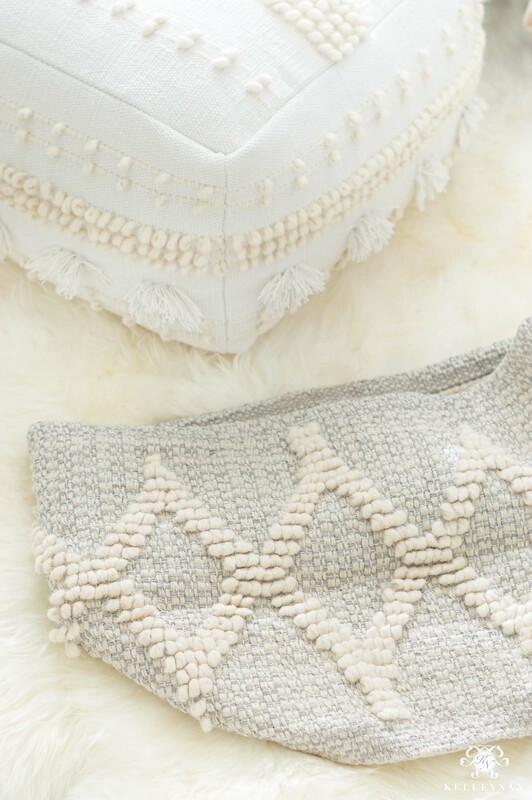 Your thoughtful touches are so beautiful with every detail from the pillow to the pouf!